The Canon iR3320N digital multi-tasking system delivers 33 ppm and consistently high quality output for both text and images - equivalent to 1200 x 600 dpi for copying and a high 2400 x 600 dpi for printing. Trayless duplexing provides productive two-sided printing. 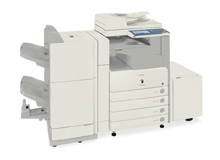 As a productive multifunctional printer, the Canon iR3320N system greatly improves your office document workflow. A3 printing, duplexing and finishing functions are easily supported. Easy, seamless network printing provides complete document management throughout your company.